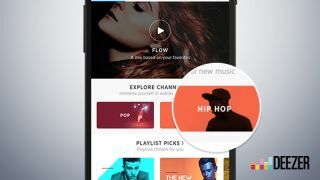 Deezer's Flow, which curates a selection of music based on your listening preferences, is set to get a substantial overhaul as part of a wider update coming to the service. The Flow functionality is similar in some ways to Spotify's Discover Weekly playlist in that it analyses your listening habits and creates a playlist of similar songs that you might like. However, unlike Spotify's efforts, Flow is much more dynamic playlist of music that doesn't get updated just once a week. This new update will make Flow much more aware of when you like to listen to certain kinds of music. If Flow finds that you frequently dislike upbeat tracks in the evening then it will limit the playing of these tracks at those times. Although the service uses like and dislike buttons to understand your music preferences, it also watches out for which tracks you skip and which you listen to all the way through. Deezer's aim with Flow is to create a "lean back experience" in music listening where you don't have to manually find music to listen to. If you just want to listen based on genre rather than your own past listening then Deezer's new Channels section features a combination of curated and automatically sorted music based on 20 genres. Also new with the update is Live Radio functionality which will allow you to listen to traditional radio stations through Deezer. Interestingly, on certain radio stations (46 to be exact, including BBC Radio 1, Radio X and BBC Radio 6) you'll be able to use the software's Fingerprinting feature to automatically add a song that's being played to a personal playlist to stream from Deezer on-demand. The functionality works using Shazam-style song recognition software and will initially be available on radio stations across the UK, France and Germany before being rolled out to other territories. The new features are available on Deezer now across both desktop and mobile apps in the UK, and will be making their way to the US in a couple of weeks time.